A captured Chinese dadao being held by a Japanese soldier. Note the unique sawback blade. Source: Author’s Personal Collection. 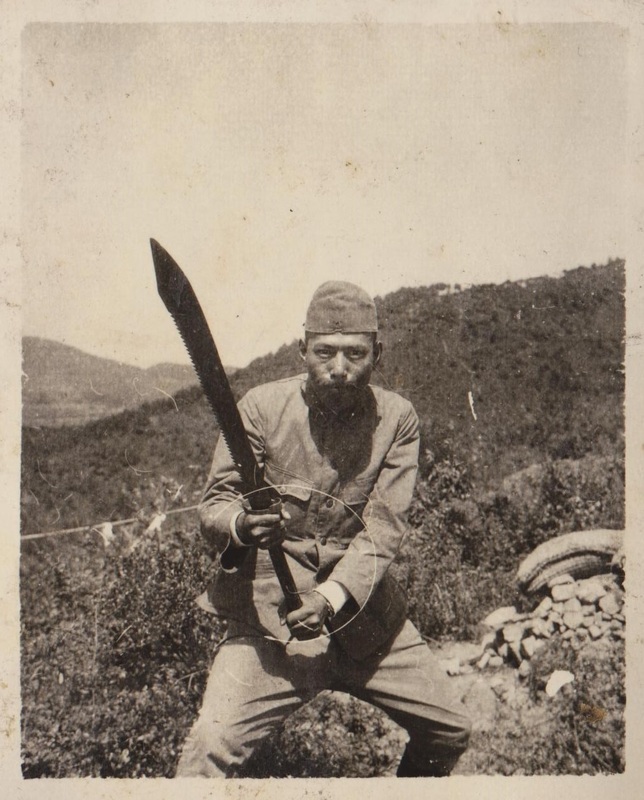 Recently I had the good fortune to come across a photograph of a Chinese dadao (big knife) that dates to the late 1930s. Images such as these were sometimes collected by Japanese soldiers in occupied China and subsequently ended up back in Japan. Obviously photos of Chinese martial artists and traditional weapons are not nearly as common as snapshots of friends or famous places, but they do show up from time to time. Given how rare Chinese photographs of these same subjects are, such images are an important additional source of data. They are particularly helpful in suggesting exactly what sorts of bladed weapons were still being used and encountered by various forces in the 1930s and 1940s. Images such as these fall into a couple of categories. On the one hand are snapshots that were taken by individuals who were actually on the scene. These tend to be rather rare. More common are photographs that look like they have been taken by local photographers and then sold to various soldiers. Many of the images of scenic landscapes and monuments which are often seen in these sorts of collection fall into this latter category. While these sorts of photos are not really all that rare, their usefulness to scholars is limited by the fact that various ephemera dealers in Japan have tended to break up the original albums so that these images can be auctioned off one by one. While this practice increases their profit margins (mostly because a small number of subjects are highly sought after by certain collectors), it destroys the original historical and sociological context of the photographs. Unless these images are labeled (which does happen from time to time) we cannot usually identify their setting or participants. Today’s image is interesting in that it was part of a large lot of photos all taken from the same album. While the owner of the album is not known, by looking at the photos that he collected we can make some guesses about who he was and where he was stationed. I strongly suspect that this image was originally collected by an enlisted soldier in Japanese army who was stationed in Hangzhou (Zhejiang Province) in the early years of the Japanese occupation of that city. Most of the pictures in this particular collection did not feature military scenes. Rather this soldier collected a number of very well composed images of famous attractions in the Hangzhou area. Many of these places (including the Six Harmonies Pagoda and the Moon Mirroring Pool) are still tourist destinations today. A couple of less identifiable landscapes pictures were also present, including one very nice image of garden walkway through the middle of a highly manicured bamboo grove. The only other “military” image in this small collection also focused on the presence of swords on the modern battlefield. That particular photograph featured four or five Japanese soldiers sitting around in various states undress cleaning and inspecting their Gunto (katanas). It was actually one of the more remarkable images that I have ever come across in a soldier’s album. These particular individuals were going out of their way to look unpleasant. Some of them were actually leering at the camera as they fingered their blades. The entire scene looked as though someone had ordered a group of “Japanese villains” from central casting for a bad Kung Fu film. Needless to say that image went to a collector with deeper pockets than me. I was a bit disappointed not to have won any of the landscape photos that made up the bulk of this particular album. Often such images are ignored, but for some reason these actually attracted a fair amount of attention. Still, I did manage to take home the one photograph that was really interesting from the perspective of Chinese martial studies. A detail of the sawback dadao. Source: Author’s personal collection. 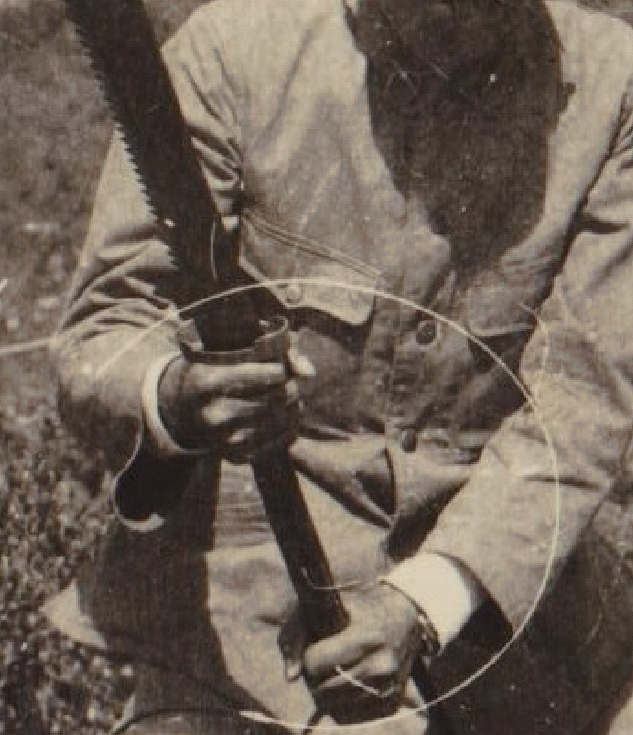 This particular image shows a Japanese soldier holding a captured Chinese dadao. The print itself is fairly small, being no larger than a passport photo. The image is quite clear, but unfortunately it has been scratched over the years. Maybe I will try to clean this one up at some point. Readers should also note the sandbag position in the background of the image. The dadao in this image is fairly unique. In my years of collecting both vintage blades and photographs I have never run across a specimen quite like this one. This is a good sized weapon. While many of these swords had surprising short blades, that is not the case with the current example. The handle is also generous in length and appears to be covered in wood. Give the angle of the blade it is hard to tell what the pommel looks like, but the sword has a heavy “cup shaped” hand guard. I suspect that this is made from brass or bronze given its lighter color. Note that it appears to be slightly clover shaped and is less deep along the sides of the blade. The blade of this particular sword is its most remarkable feature. I have never seen a period dadao with a “sawback” design before. The teeth of the saw are pronounced and clearly visible running along the spine of the blade. Similar features were included on swords and bayonets issued to “pioneer” or engineering units in Europe from about the middle of the 19th century onward. By 1900-1920 such weapons had fallen distinctly out of favor. I suspect that while originally intended as a multipurpose tool for cutting wood and building wooden structures, the saws on most of these weapons were probably not very effective. This dadao might have been a different story. The length of the blade would have given this saw a much more useful draw, and the curve of the spine (as well as the weight) might have made for some good cutting ergonomics. If nothing else those teeth look like they might have had real bit. A lot of this would come down to what sort of steel was actually used and how it was hardened, all of which is impossible to tell from a photograph. Still, this looks to be a substantial and well-made weapon, at least by the standards of the dadao. Now that we know that these were out there, I will have to keep my eyes open for other examples. Over the last few years I have focused a lot of my collecting on Nepalese military kukri. These traditional knives are still issued to Gurkha soldiers today and there are many accounts of their use on the modern battlefield. Still, what has always interested me the most about the kukri is its utility as a general purpose survival tool. Yes, it can be a weapon, but it can also chop wood, build shelters, start fires and butcher animals. I suspect that it is this genuine versatility (as well as a degree of romanticism) that has allowed the kukri to survive as a battlefield tool for this long. The dadao presents us with a contrasting case. These swords were much bigger and heavier than a kukri. Nor are they particularly useful. While some of them are so poorly weighted that they feel more like an ax than an actual sword, their blades were never intended for chopping wood. They were much more a single purpose weapon. I have often wondered whether anyone attempted to make the dadao into a more versatile tool. This picture would seem to indicate that at least a few manufactures were thinking along these lines. Still, we will need to inspect some period examples (if any have survived) before we can judge the extent to which they succeeded. That was an enjoyable post. Thanks for sharing. This dadao in particular is a real head scratcher. Not only does the spine of the blade have saw teeth, but the cup guard is also an unusual shape. Why the wide cut out notches on the rim. Maybe it was just a convenient prefab material at hand, or possibly another aspect of some new multi-tool for the soldiers like you theorized. Generally speaking, what I think is most interesting about these military dadao is the variability in the examples you see as a researcher and or collector. Some are big heavy two handed beasts that look and feel quite crude. Others are both expertly machined and finished in both fit and feel with graceful lines to boot. In the article you said, “I have often wondered whether anyone attempted to make the dadao into a more versatile tool.” A while back I owned an example that was very short and unit marked. It really had the feel of a very large knife rather than a two handed chopper, but clearly still in a military dadao form. To me it appeared to be that mating of both camp tool and battle weapon as you mentioned. With all that said it makes sense to me to appreciate these dadao one example at a time and be careful not to generalize too much about them without continued research. If my memory serves me well I believe Brian Kennedy used the term “complete junk” to characterize most of the examples used in the Sino-Japanese War in the article he contributed to this blog. I do not agree with him. Right now I appreciate the broad spectrum of quality and execution of these iconic weapons. For me at this point it seems variation is the rule, rather than the exception. I have noticed, for instance, that even when you run across dadao that seem to conform to the suggested lengths and weights (as listed in various period manuals) that the feel of any two swords can be totally different. It all depends on things like the length of the handle, or how the blade is ground. I would love to find some period accounts discussing how these swords were made in various settings. There have been so many projects recording the history of the second sino-Japanese war, but I have never come across an account of a dadao workshop. If we ever do I think it will be quite revealing. Could this dadao have been made from a sawblade ?